Defence Secretary Gavin Williamson has today officially opened a Bolton-based factory where almost 700 staff are making multi-million-pound missiles for British soldiers, warships and fighter jets. It marks a major milestone for the new site, where design, engineering and manufacturing experts are producing state-of-the-art equipment and systems. Complex weapons being built there will go on to do everything from arming F-35 fighter jets to protecting British troops and Royal Navy ships, whilst the move to the site has seen 100 new jobs created. Defence Secretary Gavin Williamson said: “This £50m factory supports 700 jobs in Bolton, showing how central strong British defence industry is to our national prosperity. “MBDA’s investment has created more than 100 new jobs, and this has been supported by a £400m contract from the Government helping to create a further 100 roles within the company. MBDA has a history in the Lancashire region stretching back for more than 80 years when the Lostock site was first opened to build propellers for the war effort. The new facility will now replace that site and provide a truly cutting-edge solution, designed to meet the modern requirements of the MOD and worldwide export customers. It will significantly improve the company’s manufacturing and test capabilities, as well as making them a more agile outfit whilst improving value-for-money for the taxpayer through contributing further cost reductions to the £1.4 billion in savings already generated by the innovative partnership approach to complex weapons between the MOD and MBDA. 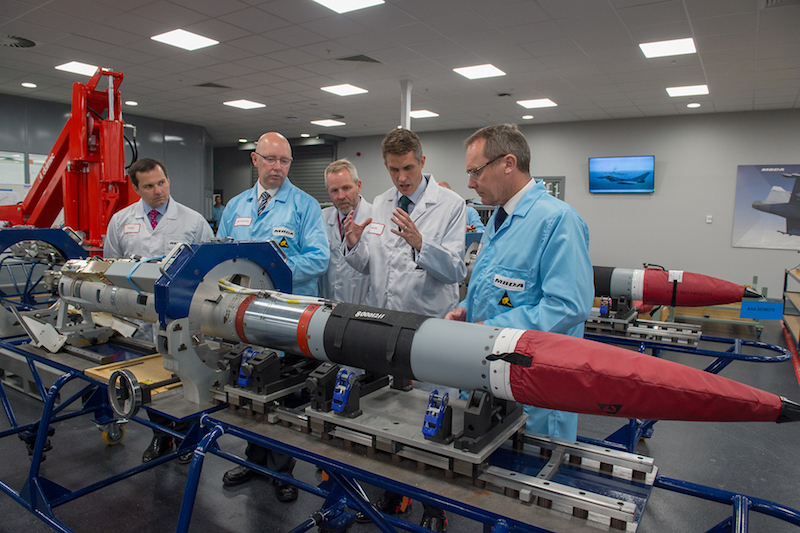 Work at the site was given a boost just last April when the Defence Secretary signed a £400 million deal with MBDA to upgrade the ultra-accurate Brimstone missile to become compatible with Typhoon jets. That contract created around 130 new jobs and sustained a further 270 existing jobs at MBDA’s sites in Bolton, Stevenage and across the supply chain. The new facility will also support the Anglo-French “One Complex Weapon” Centres of Excellence initiative - a cross Government scheme which will allow MBDA to develop cutting-edge technology in both the UK and France, while driving new ways of working and increasing efficiency. The official opening also saw MBDA re-sign the Armed Forces Covenant by which it has already shown its commitment to the military community through facilitating flexible working, support and leave schemes for reservists and participating in the MOD Employer Recognition scheme as well as directly supporting several armed forces charities. MBDA’s new high-tech manufacturing facility in Bolton has today been officially opened by the Rt. Hon. Gavin Williamson MP, UK Secretary of State for Defence. The cutting-edge facility houses some 670 highly-skilled design, engineering and manufacturing employees and is being used for the production of inert missile equipment and systems. An opening ceremony conducted by the Secretary of State marked the completion of five years of development and £50 million of investment by MBDA. The new site will significantly improve MBDA’s design, test and production capabilities – securing the UK’s and the company’s world-leading status in complex weapons technologies, as well as leading manufacturing capabilities in the North West for the next 25 years and beyond. Mr Williamson toured the production floor at Bolton and visited some of MBDA’s innovative and industry-leading centres of excellence. The new Bolton site is where a number of key missiles are being produced for the UK Armed Forces, delivering operational sovereignty and freedom of action to the UK. These systems include Brimstone, ASRAAM, CAMM (Sea Ceptor and Land Ceptor), SPEAR, and Meteor which has its final assembly for all six European partner nations carried out at MBDA Bolton. The site will also play a key role in exports, underpinning the UK Government’s Prosperity Agenda. During his visit, the Defence Secretary participated in the re-signing of the Armed Forces Covenant by MBDA, an important commitment by the company in support of what our Armed Forces do for the country. The visit concluded with the Secretary of State for Defence meeting employees who spoke about the wide range of activities undertaken at the site and how proud they are to play a strategically important role in UK Defence.